When most people think of an epileptic seizure, they envision a person falling to the floor, twitching and jerking uncontrollably. However, this dramatic form of a seizure (generalized tonic-clonic) is only one type of epilepsy. There are many other forms that can manifest so subtly so as to go unnoticed. Epilepsy affects approximately 2.5 million Americans making it the most common neurological disorder. Epilepsy was first described in ancient Babylon over 3,000 years ago. The word epilepsy has its derivation from a Greek word meaning “attack.” Historically, persons with epilepsy were often regarded as possessed – either by gods or demons. At a physiological level, epileptic seizures result from temporary changes in the electrical function of the brain that affect awareness, movement, or sensation. There are many causes of epilepsy ranging from heredity to illness or injury of the brain. When the cause has been clearly identified (such as brain injury resulting from an automobile accident), the epilepsy is called “symptomatic.” About two-thirds of epilepsy cases are call “idiopathic” meaning the cause is unknown. During Edgar Cayce’s era, idiopathic epilepsy was called “pure” or “true” epilepsy. This is a very significant point because Edgar Cayce referred to “true” epilepsy in several readings wherein he identified the causes of idiopathic epilepsy that have eluded modern medical science. From a mainstream medical perspective, epilepsy is an incurable condition. Although about 80 percent of epilepsy patients respond favorably to medicines or surgery with a decrease or elimination in seizures, the remaining 20 percent continue to suffer from seizures even with the best medical treatment. Fortunately, for some people (especially children), epilepsy does eventually go away. In recent years, some fascinating alternative treatment options have become more accepted. Although the ketogenic diet has been around for decades, a movie that aired on national television a few years ago prompted renewed interest in this novel treatment. The ketogenic diet is low in calories and high in fat. It is used most commonly in children who do not respond to medications and are not good candidates for brain surgery. This very restrictive diet requires careful supervision. Surgical implantation of a vagus nerve stimulator is another novel approach to decreasing or eliminating seizures. This procedure consists of implanting in the chest a pacemaker-type device that stimulates the vagus nerve running between the head and the abdomen. This is particularly fascinating because Edgar Cayce repeatedly stated that the cause of seizures in most cases of epilepsy can be traced to the abdomen. Edgar Cayce gave many readings for individuals suffering from various forms of epilepsy. While recognizing the wide variability of epilepsy, he also stated that in most cases the cause of the illness was not in the brain. The organs of the digestive system (abdomen) were most often cited as the source of the problem. Specifically, Cayce insisted that most cases of epilepsy are caused by abdominal adhesions. Adhesions can be formed when inflammation or injury results in scar tissue that holds together two structures that are normally separate. Edgar Cayce mentioned many causes of abdominal adhesions in epilepsy, including: injury or trauma, childhood fevers producing inflammation in the abdomen, spinal injuries (particularly to the lower spine), pregnancy complications, and birth trauma resulting from difficult or abnormal deliveries. This peculiar pathology in the abdomen was linked to a unique pattern of thermal variation on the surface of the skin. Cayce stated that, “From every condition that is of true [i.e., idiopathic] epileptic nature there will be found a cold spot or area between the lacteal duct and the caecum.” (Cayce) The lacteal duct and caecum are on the right side of the abdomen just below the last rib and extending down to the hip. Cayce said that the coolness resulted from decreased circulation through the area of the lacteal adhesions. Cayce’s statement represents a very straightforward hypothesis that can be tested using modern thermographic equipment. At Meridian Institute we have been measuring abdominal temperatures in epilepsy patients and other individuals to explore this hypothesis. Our preliminary studies suggest that Cayce was correct about the abdominal cold spot. We intend to increase our research efforts in this area in the coming year. We have also discovered articles in the medical literature that discuss “abdominal epilepsy” and “visceral reflex epilepsy” which are consistent with the Cayce hypothesis. The treatment rationale that underlies Edgar Cayce’s therapeutic approach flows naturally from his premise as to the most frequent cause of epilepsy. Since Cayce insisted that most cases of epilepsy were caused by adhesions in the lacteal ducts of the abdomen, treatment is generally directed at breaking up adhesions in the lacteal duct area located along the right side of the abdomen. 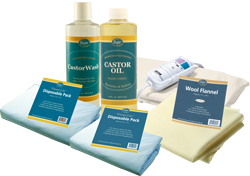 The most frequent therapy recommended by Cayce for breaking up these adhesions was castor oil packs. Edgar Cayce stated that when a piece of flannel cloth is saturated with hot castor oil and placed on the abdomen, the combination of the heat and oil will break up the adhesions that can trigger seizures.